In the late 90s and early 2000s, I began my exploration of New Media in the realms of digital and Internet art. I applied traditional art skills with my tendency for nontraditional experimentation, independent learning and rapid adaptation to new tools. In 2005 I discovered Second Life, a user-created 3D virtual reality internet world. Second Life users, called "residents," create and customize avatars (digital bodies), socialize, connect, create, and interact using text and voice chat. 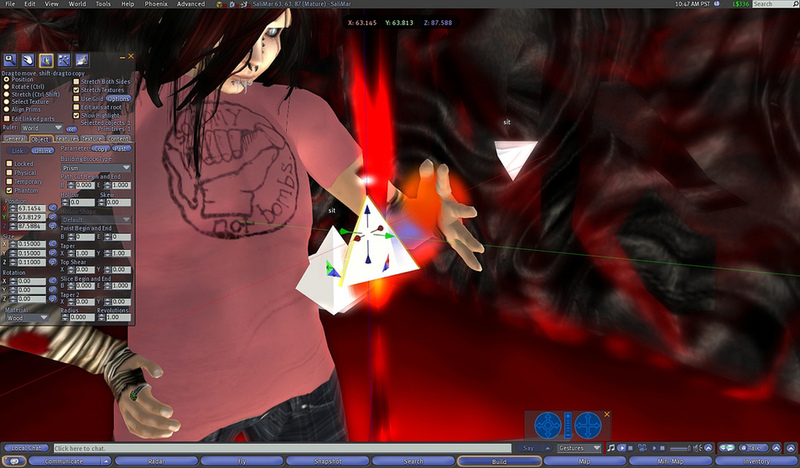 Second Life's environment made it possible for me to create art in a 3D environment using uploaded textures and sound clips, in-world building-block tools, and programming scripts. Collaborating with other artists and people in technical fields, I have created virtual art in which visitors from all over the globe experience immersive installations that integrate music, static imagery, video, narrative, interactive objects, and full 3D points of view. Most of my projects have focused on themes of trauma, power, and social issues. I consider my highly-customized avatar, a genderless humanoid with a third eye, to be an integral aspect to the artwork I do within Second Life. I consider it a continually evolving stylized self-portrait, and its androgynous features are an expression of and a commentary on breaking the boundaries of gender norms. I believe that augmented and virtual reality art has immense potential for not only fine art and entertainment applications, but also the potential to improve education, community-building, and social change. ORIENTATION was a multimedia promenade performance incorporating audience participation. The first performance of ORIENTATION was a cross-reality event in 2008. It was broadcast simultaneously to a real-life cinema in Amsterdam for art collective PLANETART's event PICNIC08 and was also experienced live via Second Life in-world virtual video screens. Attendees who were invited to participate in ORIENTATION event logged into Second Life from various locations around the world. They would then teleport their avatars to the event location, change into Bunnyken (bunny/chicken hybrid) avatars, and follow directions from the actors (ORIENTATION employees). Due to the nature of the performance, numbers were limited to 10 guests per performance. ArthOle reformed temporarily for the 2011 Odyssey Performance Art Festival to host a remixed performance of ORIENTATION. Police Officers: Dekka Raymaker (UK artist Andrew MacLachlan) & Penumbra Carter (US/UK artist Beth Holmes). Machinima (video) made on Sunday 10th July, 2011, by Chantal Harvey.